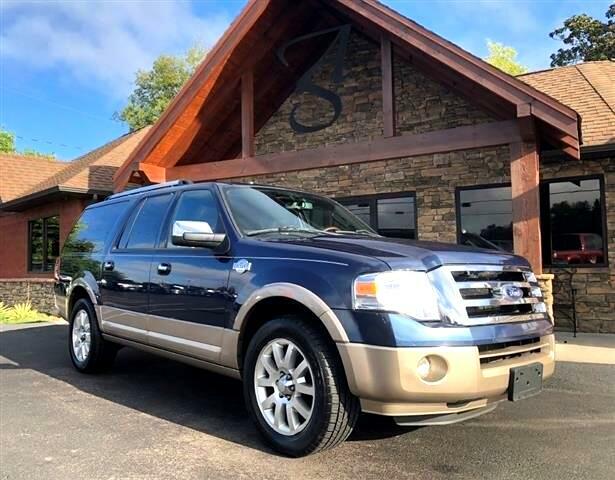 Blue Jeans Metallic 2013 Ford Expedition EL King Ranch Clean CARFAX. RWD 6-Speed Automatic 5.4L V8 SOHC 24V FFV Moonroof Sunroof, Bluetooth Hands free, Touch Screen Navigation, Rear View Camera, Power Third Row seats, Second Row Heated Seats, Heated and Cooled Front Seats, Leather, ABS brakes, Compass, Electronic Stability Control, Equipment Group 401A, Front dual zone A/C, Heated & Cooled Perforated Leather Fr Bucket Seats, Heated door mirrors, Heated front seats, Heated rear seats, Illuminated entry, Low tire pressure warning, Power Moonroof, Power Running Boards, Radio: Voice-Activated Navigation w/HD Radio, Remote keyless entry, Traction control. Odometer is 10022 miles below market average!